IBM® Flex System™ products are ideally suited for data center environments that require flexible, cost-effective, secure, and energy-efficient hardware. IBM Flex System V7000 Storage Node is the latest addition to the IBM Flex Systems product family and is a modular storage system designed to fit into the IBM Flex System Enterprise chassis. When purchased in the IBM PureFlex™ configurations, IBM Flex System V7000 Storage Node is configured from the factory into the hardware solution purchased. If, however, the configuration wanted is not offered in the predefined offerings, then a "Build to Order" configuration is designed to meet your needs. IBM Flex System V7000 Storage Node includes the capability to virtualize its own internal storage in the same manner as the IBM Storwize® V7000 does. It is designed to be a scalable internal storage system to support the compute nodes of the IBM Flex System environment. 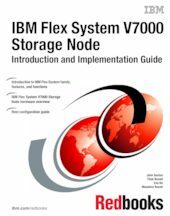 This IBM Redbooks® publication introduces the features and functions of IBM Flex System V7000 Storage Node through several examples. This book is aimed at pre-sales and post-sales technical support and marketing personnel and storage administrators. It can help you understand the architecture of IBM Flex System V7000 Storage Node, how to implement it, and how to take advantage of the industry leading functions and features.